Charleston is a popular tourist destination and has been on my list of places to visit for years. With its beautiful beaches, historic sights and hip neighborhoods, this southern city proved to be the perfect weekend getaway. My partner in crime for this mini-break was BFF Traci. After a failed attempt to get together in December due to the weather, the stars aligned on locations and dates for a special three day catch up. Fun and wine were our objectives and this itinerary delivered on both counts. I'm still a budget minded traveler and to ensure I had funds for drinks and eating out, we decided to rent an apartment outside of expensive downtown vs. a hotel. We lucked out with this adorable Airbnb apartment in the charming Avondale neighborhood of West Ashley, just two miles from downtown and home to some of Charleston's hippest new restaurants and shops. 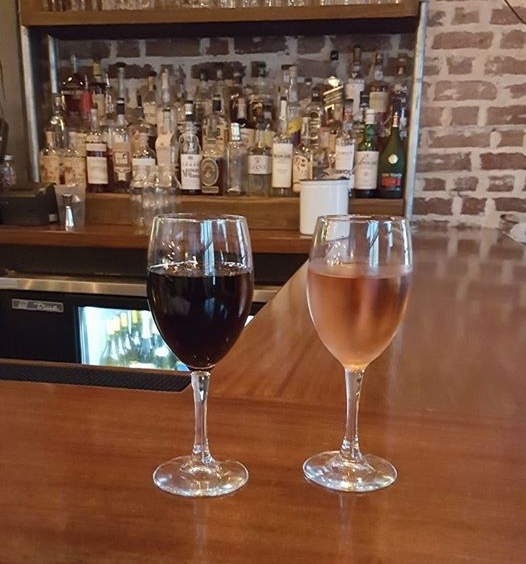 After checking in, we got right into the girl's weekend spirit by partaking in a glass of wine at Al Di La, a casual Italian restaurant one block away in the heart of the restaurant district. After a bit of wine, and tired from our long drives (Traci/Florida & Paula/North Carolina), we headed back to the apartment where Traci served up steaks, a bottle of red and great conversation until we retired to our comfortable beds. After a great nights's sleep, we were up early and raring to go with a girl's weekend staple: pedicures and a mimosa. Sufficiently beautified, we hit up West Ashley's boutiques and thrift shops for a few treasures until hunger forced us to break for lunch at Angel Oak, a spot that had been recommended by our waitress at Al Di La the previous night. A few miles west on Savannah Highway, this acclaimed restaurant specializes in Southern 'low country' cuisine with a modern touch. They definitely lived up to the hype as we savored the divine Bang Bang Shrimp and Grits over a glass of gorgeous New Zealand Sauvignon Blanc and, perhaps, a few secrets which I cannot confirm or deny. By now, it was sizzling hot and the only solution was to make a run for famed Folly Beach and some fresh sea breezes. Traci proved to be one hell of a navigator by finding free street parking mere blocks away from the crowded beach. We walked along the water and checked out the scene while the waves lapped at our freshly painted toes. Temperatures soared close to 100F (38C) and after a bit decided an icy cocktail was in order, so off to Rita's Seaside Grille we went. Seated at the outdoor bar of this Folly Beach institution, we drank lime vodka slushes and enjoyed live music while our gab-fest continued in earnest. Back at the apartment, we freshened up and decided to stick to our neighborhood again, this time at Pearlz Oyster Bar for some seaside favorites, mussels and crab cakes. We left Pearlz as the sun was setting and the area was coming to life with lots of live music and groups of party-goers descending on the neighborhood. As we started our day early, we didn't join in, but rather got into pajamas and drank wine while we planned our Sunday itinerary. Up early once again, we decided Sunday was our day to explore downtown, and grabbed an Uber bound for Poogan's Porch. Set in an 1888 Victorian townhouse, we took advantage of the lack of crowds and enjoyed a decadent and leisurely breakfast at this French Quarter favorite. Charleston specialty, She Crab soup and a mimosa. Seated on the balcony with a pitcher of mimosas and the best French Toast of my life, we chatted away as tourists on horse drawn carriage tours stopped and took our photo. Ok, they were photographing the building, but still, we were in them. It had threatened to rain the entire weekend and while we basked in a glorious Saturday, our luck ran out on Sunday. As we finished up our walking tour of the historic cobblestone streets of the French Quarter, the skies opened up, forcing an impromptu, rain-soaked pub crawl. 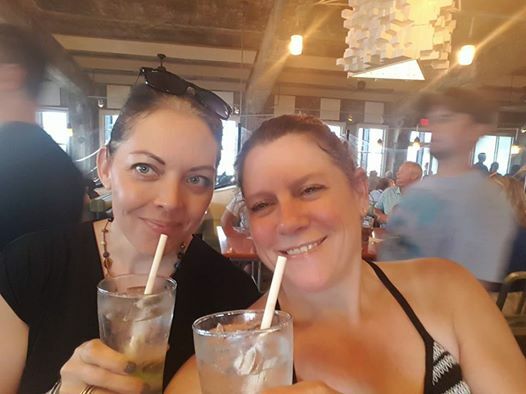 We took cover at Fleet Landing, a massive restaurant overlooking the water, but after one vodka tonic we found the crowds were a bit much, so dashed to Poogan's Smokehouse for wine and waited out the rest of the storm. Thunder, rain and wine at Poogan's Smokehouse. An hour later, the rain had passed and so we dried out by shopping along famed King Street before partaking in a special treat (for me, as I also review cat cafes over at website The Neighbor's Cat), a reservation at Pounce Cat Cafe & Wine Bar. What could be more girly than a glass of wine with a kitten in one's lap? Nothing, it turns out. Pounce exceeded my expectations with a lovely space, even lovelier staff and the fact that there were 36 kittens (a record in my cat cafe adventures) on hand. Could this be any CUTER?? It was sweetness overload and that's ok.
After our massive breakfast I didn't think I could eat another bite, but I also couldn't bear the thought of leaving South Carolina without eating BBQ, so I dug deep with one final pig out at Swig & Swine. It was the perfect location to cap off our weekend. Casual, yet a cut above the typical BBQ joint, we enjoyed hefty portions of meat and a final glass of wine as we promised not to let too much time pass before we saw each other again. Monday morning, we resumed our normal lives, but left Charleston satisfied that we experienced the quintessential girl's weekend with a little pampering, a lot of wine and enough memories to tide us over until the next time.